At SoOPAK, we provide custom boxes that help you achieve business success. We are here to take care of your packaging needs so you can focus on other issues. Whether you are a business owner, creative designer, or just a box lover, we want you to be satisfied with your purchase. Your satisfaction is our highest priority. We are sorry if things didn’t work out. We will gladly refund or exchange the products for any quality issues within seven calendars upon the delivery of the products. See below for detailed terms & conditions. Under what conditions does SoOPAK accept product return? The boxes are customized and therefore, are not qualified for resale. Regarding returning the boxes, the customer must contact SoOPAK customer service team within 10 business days upon the delivery of the boxes. The customer can only ship back the boxes once SoOPAK customer service team approves the request. SoOPAK does not accept any returning products other than quality issues caused by printing. Also, if the defects are identified in <SoOPAK Quality Checklist> (link to this document is required) , the products are not subject to return. 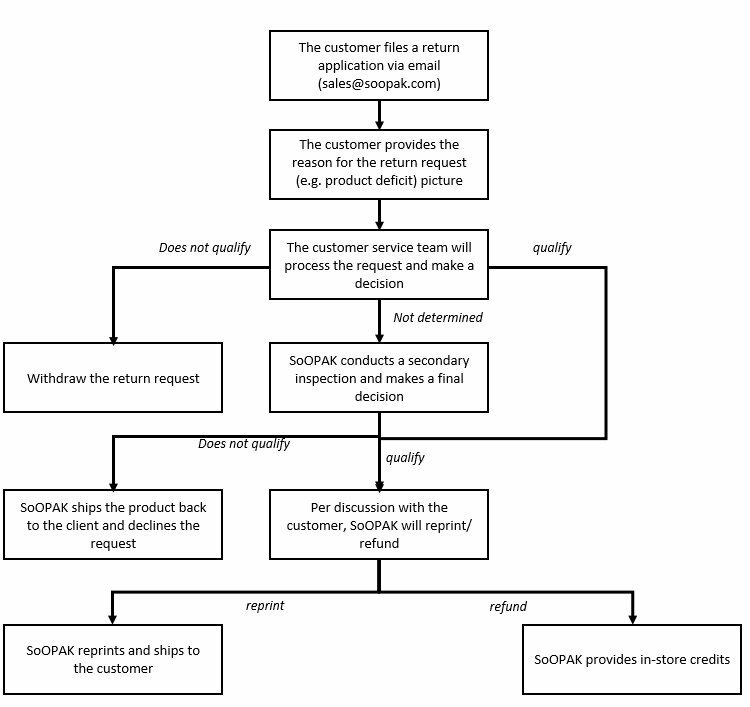 If a refund is required for the product return, SoOPAK will provide in-store credit to the customer’s online account. The customer may use the credits for any further purchases. How to file a request/ return the products? When/ How will I get my money back? Coupon/ In-store credits are not subject to refund; If the customer applies the coupon/ in-store credits for multiple products, the coupon/ in-store credits will be pro-rated based on the value for each product.